1. Clicking on all thumbnails and larger images in the main text will produce both larger images and additional information. 2. 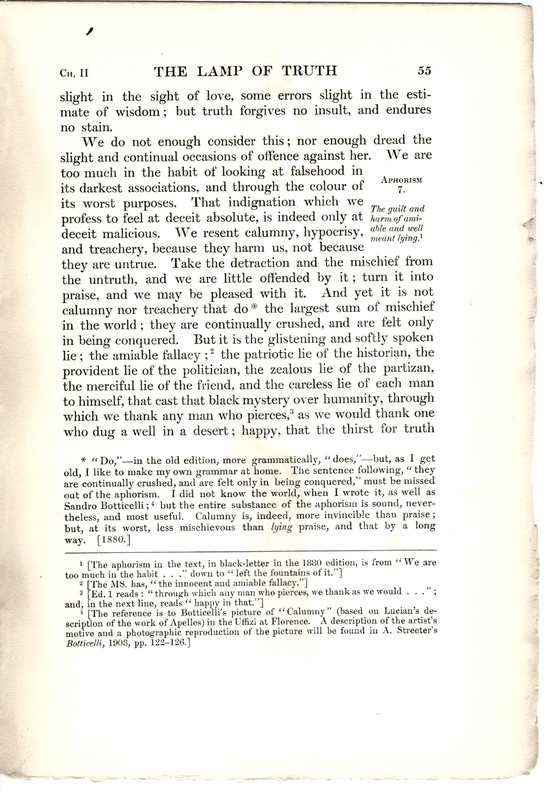 Page breaks in the Library Edition text are indicated in the following manner: [221/222]. 3. This web version of Seven Lamps has four kinds of notes, three of which appear in this left column. Clicking on the back button returns you to your place in the main text. (b) Those labelled “LE note”: annotations by the editors of the Library Edition, which include cross references to Ruskin's other published and unpublished writings, passages from the manuscript of Seven Lamps, and identifications of quotations and allusions. Where the editors footnote one of Ruskin's notes, it appears so identified following the one of his upon which it comments. (c) Those labeled “GPL note”: annotations by the web editor occasionally appear as separate notes but, more commonly, immediately following those by the editors of the Library Edition. For example, when the LE identifies but does not quote biblical texts, GPL has added the relevant passahe from the King James Bible. (d) Links in the text that take you to other documents and images in the Victorian Web. 44. LE note 2, p. 156: Wordsworth: Expostulation and Reply. 48*. JR note, p. 159: Common sense still! and, this time, indisputable. Well had it been, for many a company, and many a traveller, had this 121st page 2 of the Seven Lamps been taken for a railway signal. [1880.] FPpoints out that Ruskin refers to that page in [In the edition of 1880.] but does not explain what that would be in the LE [GPL]. 80*. 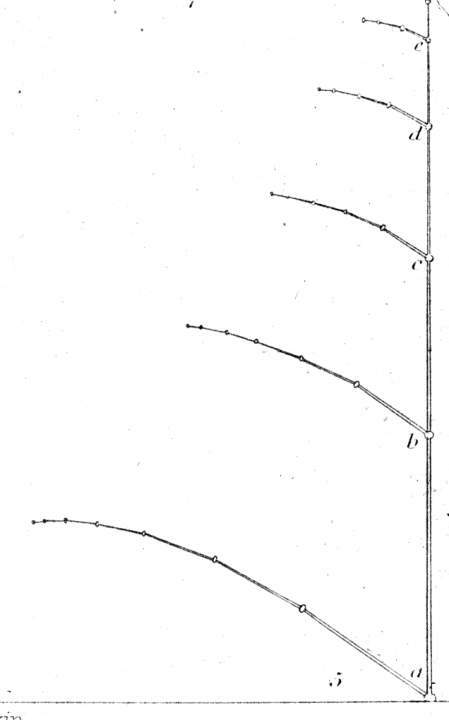 JR note, p. 177: t should be observed, however, that any pattern which gives opponent lines in its parts, may be arranged on lines parallel with the main structure. Thus, rows of diamonds, like spots on a snake's back, or the bones of a sturgeon, are exquisitely applied both to vertical and spiral columns. The loveliest instances of such decoration that I know, are the pillars of the cloister of St. John Lateran, lately illustrated by Mr. Digby Wyatt, in his most valuable and faithful work on antique mosaic. 96. JR note 2, p. 185: On the cover of this volume the reader will find some figure outlines of the same period and character, from the floor of San Miniato at Florence. I have to thank its designer, Mr. W. Harry Rogers, for the intelligent arrangement of them, and graceful adaptations of the connecting arabesque. § 1. IT was stated, in the outset of the preceding chapter, that the value of architecture depended on two distinct characters: the one, the impression it receives from human power; the other, the image it bears of the natural creation. I have en ”deavoured to show in what manner its majesty was attributable to a sympathy with the effort and trouble of human life1* (a sympathy as distinctly perceived in the gloom and mystery of form, as it is in the melancholy tones of sounds). I desire now to trace that happier element of its excellence, consisting in a noble rendering of images of Beauty, derived chiefly from the external appearances of organic nature. since they presume that the feeling of mankind on this subject is universal and instinctive, I shall base my present investiga ”tion on this assumption; and only asserting that to be beauti ”ful which I believe will be granted me to be so without dispute, I would endeavour shortly to trace the manner in which this element of delight is to be best engrafted upon architectural design, what are the purest sources from which it is to be derived, and what the errors to be avoided in its pursuit. It will be thought that I have somewhat rashly limited the elements of architectural beauty to imitative forms. I do not mean to assert that every happy arrangement of line is directly suggested by a natural object; but that all beautiful lines are adaptations of those which are commonest in the external creation; that, in proportion to the richness of their association, the resemblance to natural work, as a type and help, must be more closely attempted, and more clearly seen; and that beyond a certain point, and that a very low one, man cannot advance in the invention of beauty, without directly imitating natural form. Thus, in the Doric temple the triglyph and cornice are unimitative; or imitative only of artificial cuttings of wood. No one would call these members beautiful. Their influence over us is in their severity and simplicity.3 The fluting of the column, which I doubt not was the Greek symbol of the bark of the tree,4 was imitative [139/140] in its origin, and feebly resembled many canaliculated organic structures. Beauty is instantly felt in it, but of a low order. The decoration proper was sought in the true forms of organic life, and those chiefly human. Again: the Doric capital was unimitative; but all the beauty it had was dependent on the precision of its ovolo,5 a natural curve of the most frequent occurrence. The Ionic capital (to my mind, as an archi ”tectural invention, exceedingly base,) nevertheless depended for all the beauty that it had on its adoption of a spiral line, perhaps the commonest of all that characterise the inferior orders of animal organism and habitation. Farther progress could not be made without a direct imitation of the acanthus leaf. § 3. Now, I would insist especially on the fact, of which I doubt not that farther illustrations will occur to the mind [140/141] of every reader, that all most lovely forms and thoughts are directly taken from natural objects; because I would fain be allowed to assume also the converse of this, namely, that forms which are not taken from natural objects must be ugly.8* I know this is a bold assumption; but as I have not space to reason out the points wherein essential beauty of form consists,9 that being far too serious a work to be under ”taken in a bye way, I have no other resource than to use this accidental mark or test of beauty, of whose truth the con ”siderations which I hope hereafter to lay before the reader may assure him. I say an accidental mark, since forms are not beautiful because they are copied from Nature; only it is out of the power of man to conceive beauty without her aid. I believe the reader will grant me this, even from the examples above advanced; the degree of confidence with which it is granted must attach also to his acceptance of the conclusions which will follow from it; but if it be granted frankly, it will enable me to determine a matter of very essential importance, namely, what is or is not ornament. For there are many forms of so called decoration in architec ”ture, habitual, and received, therefore, with approval, or at all events without any venture at expression of dislike, which I have no hesitation in asserting to be not ornament at all, but to be ugly things, the expense of which ought in truth [141/142] to be set down in the architect's contract, as “ For Monstrifi ”cation. ”I believe that we regard these customary deformities with a savage complacency, as an Indian does his flesh patterns and paint (all nations being in certain degrees and senses savage). I believe that I can prove them to be monstrous, and I hope hereafter to do so conclusively; but, meantime, I can allege in defence of my persuasion nothing but this fact of their being unnatural, to which the reader must attach such weight as he thinks it deserves. There is, however, a peculiar difficulty in using this proof; it requires the writer to assume, very impertinently, that nothing is natural but what he has seen or supposes to exist. I would not do this; for I suppose there is no conceivable form or grouping of forms but in some part of the universe an example of it may be found. § 4. The first so-called ornament, then, which I would attack is that Greek fret,13 now, I believe, usually known by the Italian name Guilloche,14 which is exactly a case in point. It so happens that in crystals of bismuth, formed by the unagitated cooling of the melted metal, there occurs a natural resemblance of it almost perfect. But crystals 15 of bismuth not only are of unusual occurrence in every-day life, but their form is, as far as I know, unique among minerals; and not only unique, but only attainable by an artificial process, the metal itself never being found pure. I do not remember any other substance or arrangement which presents a resemblance to this Greek ornament; and I think that I may trust my remembrance as including most of the arrangements which occur in the outward forms of common and familiar things. On this ground, then, I allege that ornament to be ugly; or, in the literal sense of the word, monstrous; different from anything which it is the nature of man to admire: and I think an uncarved fillet or plinth infinitely preferable to one [143/144] covered with this vile concatenation of straight lines:16* unless indeed it be employed as a foil to a true ornament, which it may, perhaps, sometimes with advantage; or excessively small, as it occurs on coins, the harshness of its arrangement being less perceived. § 5. Often in association with this horrible design we find, in Greek works, one which is as beautiful as this is painful that egg and dart moulding,17 whose perfection, in its place and way, has never been surpassed. And why is this? Simply because the form of which it is chiefly composed is one not only familiar to us in the soft housing of the bird's nest, but happens to be that of nearly every pebble that rolls and murmurs under the surf of the sea, on all its endless shore. And that with a peculiar18 accuracy; for the mass which bears the light in this moulding is not in good Greek work, as in the frieze of the Erechtheum, merely of the shape of an egg. It is flattened on the upper surface, with a delicacy and keen sense of variety in the curve which it is impossible too highly to praise, attaining exactly that flattened, imperfect oval, which, in nine cases out of ten, will be the form of the pebble lifted at random from the rolled beach. Leave out this flat ”ness, and the moulding is vulgar instantly. It is singular also that the insertion of this rounded form in the hollowed recess has a painted type in the plumage of the Argus pheasant,19 the eyes of whose feathers are so shaded as exactly to represent an oval form placed in a hollow. § 6. It will evidently follow, upon our application of this test of natural resemblance, that we shall at once conclude [144/145] that all perfectly beautiful forms must be composed of curves; since there is hardly any common natural form in which it is possible to discover a straight line. Nevertheless, Architec ”ture, having necessarily to deal with straight lines essential to its purposes in many instances and to the expression of its power in others, must frequently be content with that measure of beauty which is consistent with such primal forms; and we may presume that utmost measure of beauty to have been attained when the arrangements of such lines are con ”sistent with the most frequent natural groupings of them we can discover, although, to find right lines in nature at all, we may be compelled to do violence to her finished work, break through the sculptured and coloured surfaces of her crags, and examine the processes of their crystallisation. § 7. I have just convicted the Greek fret of ugliness, because it has no precedent to allege for its arrangement except an artificial form of a rare metal. Let us bring into court an ornament of the Lombard architects, Plate XII., fig. 7, as exclusively composed of right lines as the other, only, observe, with the noble element of shadow added. This ornament, taken from the front of the Cathedral of Pisa, is universal throughout the Lombard churches of Pisa, Lucca, Pistoja, and Florence; and it will be a grave stain upon them if it cannot be defended. Its first apology for itself, made in a hurry, sounds marvellously like the Greek one, and highly dubious. It says that its terminal contour is the very image of a carefully prepared artificial crystal of common salt.20 Salt being, however, a substance considerably more familiar to us than bismuth, the chances are somewhat in favour of the accused Lombard ornament already. But it has more to say for itself, and more to the purpose; namely, that its main outline is one not only of natural crystallisation, but among the very first and commonest of crystalline forms, being the primal condition of the occurrence of the oxides of iron, copper, and tin, of the sulphurets of iron and lead, of fluor spar, etc. ; and that those projecting forms in its surface [145/146] represent the conditions of structure which effect the change into another relative and equally common crystalline form, the cube. This is quite enough. We may rest assured it is as good a combination of such simple right lines as can be put together, and gracefully fitted for every place in which such lines are necessary. § 11. But it will be said that all this want of organisation and form might be affirmed of drapery also, and that this latter is a noble subject of sculpture. By no means. When was drapery a subject of sculpture by itself, except in the form of a handkerchief on urns in the seventeenth century and in some of the baser scenic Italian decorations? Drapery, as such, is always ignoble; it becomes a subject of interest only by the colours it bears, and the impressions which it receives from some foreign form or force. All noble draperies, either in painting or sculpture (colour and texture being at present out of our consideration), have, so far as they are anything more than necessities, one of two great functions: they are the exponents of motion and of gravitation. They are the most valuable means of expressing past as well as present motion in the figure, and they are almost the only means of indicating to the eye the force of gravity which resists such motion. The Greeks used drapery in sculpture for the most part as an ugly necessity, but availed themselves of it gladly in all represen ”tation of action, exaggerating the arrangements of it which express lightness in the material, and follow gesture in the person. The Christian Sculptors, caring little for the body, or disliking it, and depending exclusively on the countenance, received drapery at first contentedly as a veil, but soon perceived a capacity of expression in it which the Greek had not seen or had despised. The principal element of this expression was the entire removal of agitation from what was so pre ”eminently capable of being agitated. It fell from their human forms plumb down, sweeping the ground heavily, and conceal ”ing the feet; while the Greek drapery was often blown away from the thigh. The thick and coarse stuffs of the monkish dresses, so absolutely opposed to the thin and gauzy web of antique material, suggested simplicity of division as well as weight of fall. There was no crushing nor subdividing them. And thus the drapery gradually came to represent the spirit of repose as it before had of motion, repose saintly and severe. The wind had no power upon the garment, as the passion none upon the soul; and the motion of the figure only bent [150/151] into a softer line the stillness of the falling veil,35 followed by it like a slow cloud by drooping rain: only in links of lighter undulation it followed the dances of the angels. Thus treated, drapery is indeed noble; but it is as an ex ”ponent of other and higher things. As that of gravitation, it has especial majesty, being literally the only means we have of fully representing this mysterious natural force of earth (for falling water is less passive and less defined in its lines). So, again, in sails it is beautiful because it receives the forms of solid curved surface, and expresses the force of another in ”visible element. But drapery trusted to its own merits, and given for its own sake, drapery like that of Carlo Dolci and the Caraccis, is always base. § 13. Now I do not mean to say that Nature never uses festoons; she loves them, and uses them lavishly; and though she does so only in those places of excessive luxuri ”ance wherein it seems to me that architectural types should seldom be sought, yet a falling tendril or pendent bough might, if managed with freedom and grace, be well intro ”duced into luxuriant decoration (or if not, it is not their want of beauty, but of architectural fitness, which incapacitates them for such uses). But what resemblance to such example can we trace in a mass of all manner of fruit and flowers, tied heavily into a long bunch, thickest in the middle, and pinned up by both ends against a dead wall? For it is strange that the wildest and most fanciful of the builders of truly luxuriant architecture never ventured, so far as I know, even a pendent tendril; while the severest masters of the revived Greek per ”mitted this extraordinary piece of luscious ugliness to be fastened in the middle of their blank surfaces. So surely as this arrangement is adopted, the whole value of the flower ”work is lost. Who among the crowds that gaze upon the building ever pause to admire the flowerwork of St. Paul's? It is as careful and as rich as it can be, yet it adds no delight ”fulness to the edifice. It is no part of it. It is an ugly excrescence. We always conceive the building without it, and should be happier if our conception were not disturbed by its presence. It makes the rest of the architecture look poverty-stricken, instead of sublime; and yet it is never enjoyed itself. Had it been put, where it ought, into the capitals, it would have been beheld with never-ceasing delight. I do not mean that it could have been so in the present building, for such kind of architecture has no business with rich ornament in any place; but that if those groups of flowers had been put into natural places in an edifice of another style, their value would have been felt as vividly as now their uselessness. What applies to festoons is still more sternly true of garlands. A garland is meant to be seen upon a head. There it is beautiful, because we suppose it newly gathered and joyfully worn. But it is not meant to be hung [152/153] upon a wall. 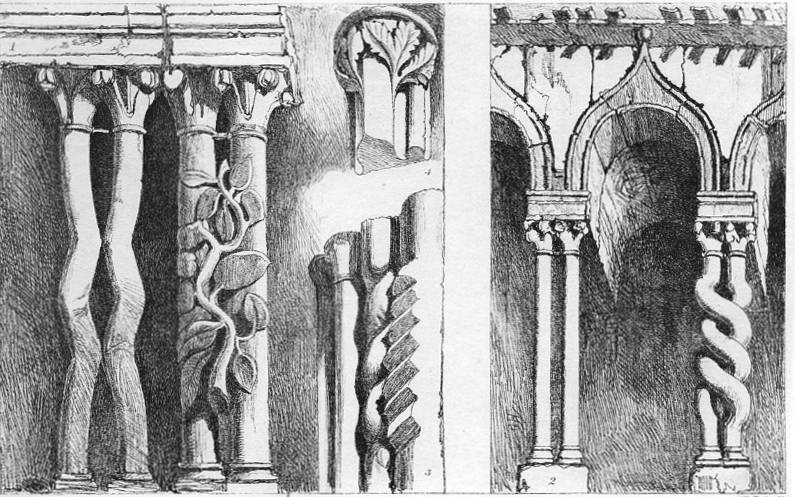 If you want a circular ornament, put a flat circle of coloured marble, as in the Casa Dario37 and other such palaces at Venice; or put a star, or a medallion, or if you want a ring, put a solid one, but do not carve the images of garlands, looking as if they had been used in the last pro ”cession, and been hung up to dry and serve next time withered. Why not also carve pegs, and hats upon them? § 14. One of the worst enemies of modern Gothic archi ”tecture, though seemingly an unimportant feature, is an excrescence, as offensive by its poverty as the garland by its profusion, the dripstone in the shape of the handle of a chest of drawers, which is used over the square-headed windows of what we call Elizabethan buildings. In the last chapter, it will be remembered that the square form was shown to be that of pre-eminent Power,38 and to be properly adapted and limited to the exhibition of space or surface. 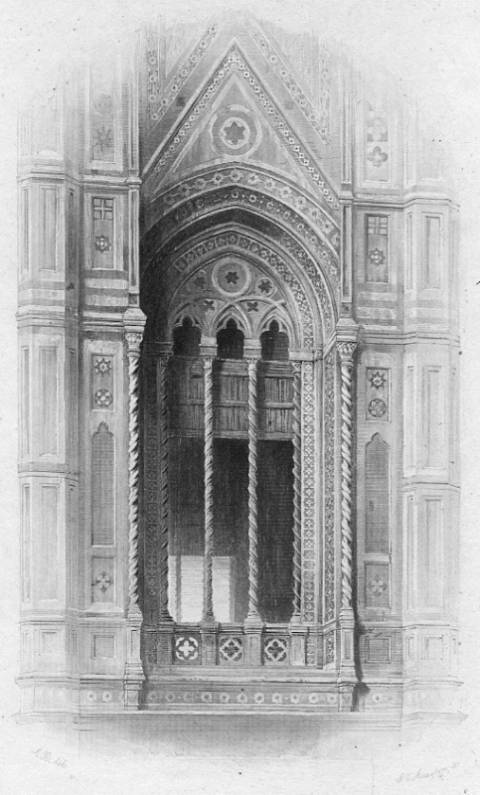 Hence, when the window is to be an exponent of power,39 as for instance in those by M. Angelo in the lower storey of the Palazzo Riccardi at Florence,40 the square head is the most noble form they can assume; but then either their space must be un ”broken, and their associated mouldings the most severe, or else the square must be used as a final outline, and is chiefly to be associated with forms of tracery, in which the relative form of power, the circle, is predominant, as in Venetian, and Florentine, and Pisan Gothic. But if you break upon your terminal square, or if ycu cut its lines off at the top and turn them outwards, you have lost its unity and space.41 It is an including form no longer, but an added, isolated line, and the ugliest possible. Look abroad into the landscape, [153/154] and see if you can discover any one so bent and fragmentary as that of this strange windlass - looking dripstone. You cannot. It is a monster. It unites every element of ugli ”ness, its line is harshly broken in itself, and unconnected with every other; it has no harmony either with structure or decoration, it has no architectural support, it looks glued to the wall, and the only pleasant property it has, is the appear ”ance of some likelihood of its dropping off. I might proceed, but the task is a weary one, and I think I have named those false forms of decoration which are most dangerous in our modern architecture as being legal and accepted. The barbarisms of individual fancy are as countless as they are contemptible; they neither admit attack nor are worth it; but these above named are countenanced, some by the practice of antiquity, all by high authority: they have depressed the proudest, and contaminated the purest schools, and are so established in recent practice that I write rather for the barren satisfaction of bearing witness against them, than with hope of inducing any serious convictions to their prejudice. Everything being then ornamental that is imitative, I [154/155] would ask the reader's attention to a few general considerations, all that can here be offered relating to so vast a subject; which, for convenience' sake, may be classed under the three heads of inquiry: What is the right place for architectural ornament? What is the peculiar treatment of ornament which renders it architectural? and what is the right use of colour as associated with architectural imitative form? § 16. What is the place for ornament? Consider first that the characters of natural objects which the architect can represent are few and abstract. The greater part of those delights by which Nature recommends herself to man at all times, cannot be conveyed by him into his imitative work. He cannot make his grass green and cool and good to rest upon, which in nature is its chief use to man; nor can he make his flowers tender and full of colour and of scent, which in nature are their chief powers of giving joy. Those qualities which alone he can secure are certain severe characters of form, such as men only see in nature on deliberate examination, and by the full and set appliance of sight and thought: a man must lie down on the bank of grass on his breast and set himself to watch and penetrate the intertwining of it, before he finds that which is good to be gathered by the architect. So then while Nature is at all times pleasant to us, and while the sight and sense of her work may mingle happily with all our thoughts, and labours, and times of existence, that image of her which the architect carries away represents what we can only perceive in her by direct intellectual exertion, and demands from us, wherever it appears, an intellectual exertion of a similar kind in order to understand it and feel it. It is the written or sealed impression of a thing sought out, it is the shaped result of inquiry and bodily expression of thought. § 18. Apply this to expressions of thought received by the eye. Remember that the eye is at your mercy more than the ear. “ The eye, it cannot choose but see. "44 Its nerve is not so easily numbed as that of the ear, and it is often busied in tracing and watching forms when the ear is at rest. Now if you present lovely forms to it when it cannot call the mind to help it in its work, and among objects of vulgar use and unhappy position, you will neither please the eye nor elevate the vulgar object. But you will fill and weary the eye with the beautiful form, and you will infect that form itself with the vulgarity of the thing to which you have violently attached it. It will never be of much use to you any more; you have killed, or defiled it; its freshness and purity are gone. You will have to pass it through the fire of much thought before you will cleanse it, and warm it with much love before it will revive. § 19. Hence then a general law, of singular importance in the present day, a law of simple common sense, not to [156/157] decorate things belonging to purposes of active and occupied life.45 Wherever you can rest, there decorate; where rest is forbidden, so is beauty. You must not mix ornament with business, any more than you may mix play. Work first, and then rest. Work first, and then gaze, but do not use golden ploughshares, nor bind ledgers in enamel. Do not thrash with sculptured flails:46* nor put bas-reliefs on millstones. What! it will be asked, are we in the habit of doing so? Even so; always and everywhere. The most familiar position of Greek mouldings is in these days on shop fronts. There is not a tradesman's sign nor shelf nor counter in all the streets of all our cities, which has not upon it ornaments which were invented to adorn temples and beautify kings' palaces. There is not the smallest advantage in them where they are. Absolutely valueless utterly without the power of giving pleasure, they only satiate the eye, and vulgarise their own forms. Many of these are in themselves thoroughly good copies of fine things, which things themselves we shall never, in consequence, enjoy any more. Many a pretty beading and graceful bracket there is in wood or stucco above our grocers' and cheesemongers' and hosiers' shops: how is it that the tradesmen cannot understand that custom is to be had only by selling good tea and cheese and cloth, and that people come to them for their honesty, and their readiness, and their right wares, and not because they have Greek cornices over their windows, or their names in large gilt letters on their house fronts? How pleasurable it would be to have the power of going through the streets of London, pulling down [157/158] those brackets and friezes and large names, restoring to the tradesmen the capital they had spent in architecture, and putting them on honest and equal terms, each with his name in black letters over his door, not shouted down the street from the upper storeys, and each with a plain wooden shop casement, with small panes in it that people would not think of breaking in order to be sent to prison! How much better for them would it be how much happier, how much wiser, to put their trust upon their own truth and industry, and not on the idiocy of their customers. It is curious, and it says little for our national probity on the one hand, or prudence on the other, to see the whole system of our street decoration based on the idea that people must be baited to a shop as moths are to a candle. § 22. It is not however only in these marked situations that the abuse of which I speak takes place. There is hardly, at present, an application of ornamental work, which is not in some sort liable to blame of the same kind. We have a bad habit of trying to disguise disagreeable necessities by some form of sudden decoration, which is, in all other places, associated with such necessities. I will name only one instance, that to which I have alluded before the roses which conceal the ventilators in the flat roofs of our chapels. Many of those roses are of very beautiful design, borrowed from fine works: all their grace and finish are invisible when they are so placed, but their general form is afterwards associated with the ugly buildings in which they constantly occur; and all the beautiful roses of the early French and English Gothic, especially such elaborate ones as those of the triforium of Coutances, are in consequence deprived of their pleasurable influence: and this without our having accomplished the smallest good by the use we have made of the dishonoured form. Not a single person in the congregation ever receives one ray of pleasure from [160/161] those roof roses; they are regarded with mere indifference, or lost in the general impression of harsh emptiness. § Must not beauty, then, it will be asked, be sought for in the forms which we associate with our every-day life? Yes, if you do it consistently, and in places where it can be calmly seen; but not if you use the beautiful form only as a mask and covering of the proper conditions and uses of things, nor if you thrust it into the places set apart for toil. Put it in the drawing-room, not into the workshop; put it upon domestic furniture, not upon tools of handicraft. All men have sense of what is right in this matter, if they would only use and apply that sense; every man knows where and how beauty gives him pleasure, if he would only ask for it when it does so, and not allow it to be forced upon him when he does not want it. Ask any one of the passengers over London Bridge at this instant whether he cares about the forms of the bronze leaves on its lamps, and he will tell you, No. Modify these forms of leaves to a less scale, and put them on his milkjug at breakfast, and ask him whether he likes them, and he will tell you, Yes. People have no need of teaching if they could only think and speak truth, and ask for what they like and want, and for nothing else: nor can a right disposition of beauty be ever arrived at except by this common sense, and allowance for the circumstances of the time and place. It does not follow, because bronze leafage is in bad taste on the lamps of London Bridge [Victorian photograph], that it would be so on those of the Ponte della Trinità51; nor, because it would be a folly to decorate the house fronts of Gracechurch Street, that it would be equally so to adorn those of some quiet provincial town. The question of greatest external or internal decoration depends entirely on the conditions of probable repose. It was a wise feeling which made the streets of Venice so rich in external ornament, for there is no couch of rest like the gondola. So, again, there is no subject of street ornament so wisely chosen as the fountain, where it is a fountain of use; [161/162] for it is just there that perhaps the happiest pause takes place in the labour of the day, when the pitcher is rested on the edge of it, and the breath of the bearer is drawn deeply, and the hair swept from the forehead, and the uprightness of the form declined against the marble ledge, and the sound of the kind word or light laugh mixes with the trickle of the falling water, heard shriller and shriller as the pitcher fills. What pause is so sweet as that so full of the depth52 of ancient days, so softened with the calm of pastoral solitude? § 24. II. Thus far, then, of the place for beauty. We were next to inquire into the characters which fitted it peculiarly for architectural appliance, and into the principles of choice and of arrangement 53* which best regulate the imitation of natural forms in which it consists. The full answering of these questions would be a treatise on the art of design:54 I intend only to say a few words respecting the two conditions of that art which are essentially architectural, Proportion and Abstraction. Neither of these qualities is necessary, to the same extent, in other fields of design. The sense of proportion is, by the landscape painter, frequently sacrificed to character and accident; the power of abstraction to that of complete realization. The flowers of his foreground must often be unmeasured in their quantity, loose in their arrangement: what is calculated, either in quantity or disposition, must be artfully concealed. That calculation is by the architect to be prominently exhibited. So the abstraction of few characteristics out of many, is shown only in the painter's sketch; in his finished work it is concealed or lost in completion. Architecture, on the contrary, delights in Abstraction and fears to complete her forms. Proportion and Abstraction, then, are the two especial marks of architectural design as distinguished from all other. Sculpture must have them in inferior degrees; leaning, on the one hand, to an architectural manner, when it is usually greatest [162/163] (becoming, indeed, a part of Architecture), and, on the other, to a pictorial manner, when it is apt to lose its dignity, and sink into mere ingenious carving. § 25. Now, of Proportion so much has been written, that I believe the only facts which are of practical use have been overwhelmed and kept out of sight by vain accumulations of particular instances and estimates. Proportions are as infinite (and that in all kinds of things, as severally in colours, lines, shades, lights, and forms) as possible airs in music: and it is just as rational an attempt to teach a young architect how to proportion truly and well by calculating for him the proportions of fine works, as it would be to teach him to compose melodies by calculating the mathematical relations of the notes in Beethoven's “Adelaide” or Mozart's “Requiem.” The man who has eye and intellect will invent beautiful proportions, and cannot help it; but he can no more tell us how to do it than Wordsworth could tell us how to write a sonnet, or than Scott could have told us how to plan a romance. But there are one or two general laws which can be told: they are of no use, indeed, except as preventives of gross mistakes, but they are so far worth telling and remembering; and the more so because, in the discussion of the subtle laws of Proportion (which will never be either numbered or known), architects are perpetually forgetting and transgressing the very simplest of its necessities. §26. Of which the first is, that wherever Proportion exists at all, one member of the composition must be either larger than, or in some way supreme over, the rest. There is no proportion between equal things. They can have symmetry only, and symmetry without proportion is not composition. It is necessary to perfect beauty, but it is the least necessary of its elements, nor of course is there any difficulty in obtaining it. Any succession of equal things is agreeable; but to compose is to arrange unequal things, and the first thing to be done in beginning a composition is to determine which is to be the principal thing. I believe that all that has been written and taught about proportion, put together, is not [163/164] to the architect worth the single rule, well enforced, “ Have one large thing and several smaller things, or one principal thing and several inferior things, and bind them well together.” Sometimes there may be a regular gradation, as between the heights of storeys in good designs for houses; sometimes a monarch with a lowly train, as in the spire with its pinnacles: the varieties of arrangement are infinite, but the law is universal have one thing above the rest, either by size, or office, or interest. Don't put the pinnacles without the spire. What a host of ugly church towers have we in England, with pinnacles at the corners, and none in the middle! How many buildings like King's College Chapel at Cambridge,55 looking like tables upside down, with their four legs in the air! What! it will be said, have not beasts four legs? Yes, but legs of different shapes, and with a head between them. So they have a pair of ears: and perhaps a pair of horns: but not at both ends. Knock down a couple of pinnacles at either end in King's College Chapel, and you will have a kind of proportion instantly. So in a cathedral you may have one tower in the centre, and two at the west end; or two at the west end only, though a worse arrangement: but you must not have two at the west and two at the east end, unless you have some central member to connect them; and even then, buildings are generally bad which have large balancing features at the extremities, and small connecting ones in the centre, because it is not easy then to make the centre dominant. The bird or moth may indeed have wide wings, because the size of the wing does not give supremacy to the wing. The head and life are the mighty things, and the plumes, however wide, are subordinate. In fine west fronts with a pediment and two towers, the centre is always the principal mass, both in bulk and interest (as having the mr.in gateway), and the towers are subordinated to it, as an animal's horns are to its head. The moment the towers rise so high as to overpower the body and centre, and become themselves [164/165] the principal masses, they will destroy the proportion, unless they are made unequal, and one of them the leading feature of the cathedral, as at Antwerp and Strasburg. But the purer method is to keep them down in due relation to the centre, and to throw up the pediment into a steep connecting mass, drawing the eye to it by rich tracery. 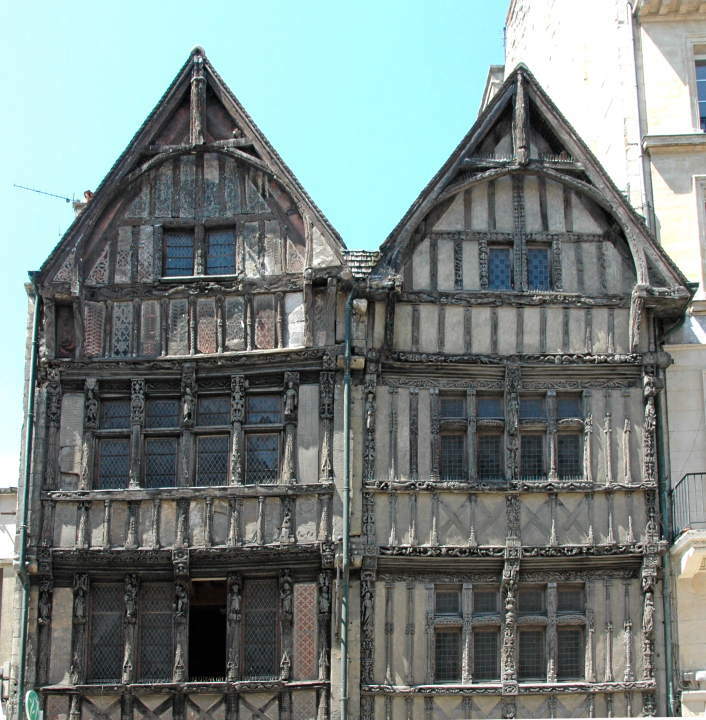 This is nobly done in St. Wulfran56 of Abbeville, and attempted partly at Rouen, though that west front is made up of so many unfinished and supervening designs that it is impossible to guess the real intention of any one of its builders. § 27. This rule of supremacy applies to the smallest as well as to leading features; it is interestingly seen in the arrangement of all good mouldings. 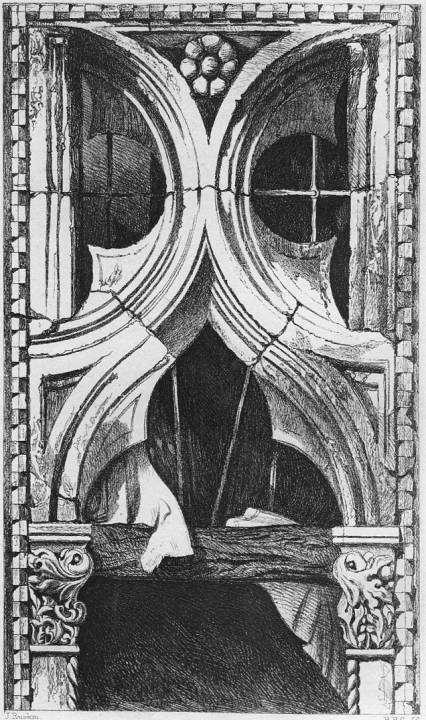 I have given one, on the opposite page, from Rouen Cathedral; that of the tracery before distinguished as a type of the noblest manner of Northern Gothic (Chap. II. § 28). 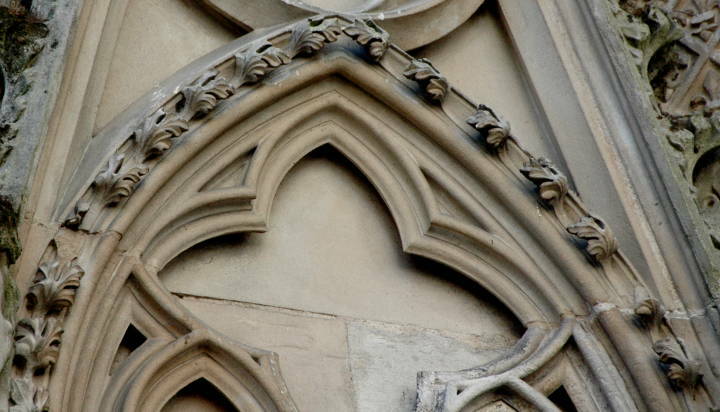 It is a tracery of three orders, of which the first is divided into a leaf moulding, fig. 4 and b in the section, and a plain roll, also seen in fig. 4, c in the section; these two divisions surround the entire window or panelling, and are carried by two-face shafts of corresponding sections. 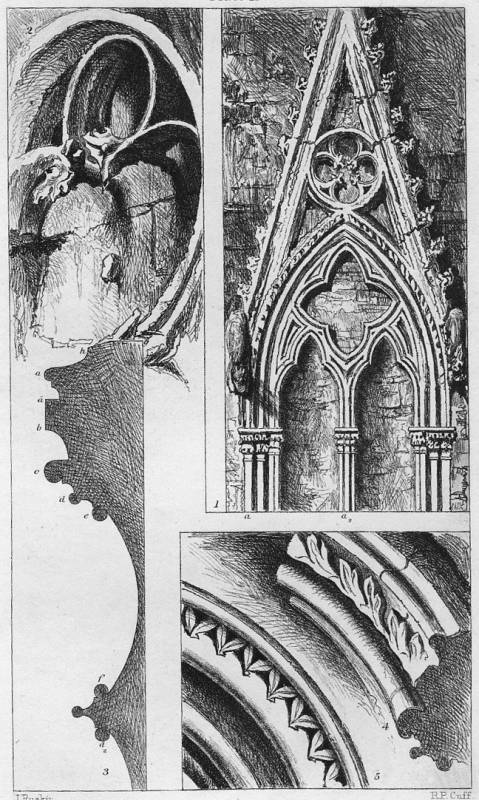 The second and third orders are plain rolls following the line of the tracery; four divisions of moulding in all: of these four, the leaf moulding is, as seen in the sections, much the largest; next to it the outer roll; then, by an exquisite alternation, the innermost roll (e), in order that it may not be lost in the recess, and the intermediate (d), the smallest. Each roll has its own shaft and capital; and the two smaller, which in effect upon the eye, owing to the retirement of the innermost, are nearly equal, have smaller capitals than the two larger, lifted a little to bring them to the same level. 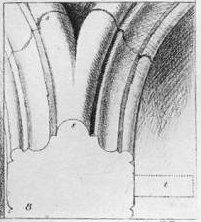 The wall in the trefoiled lights is curved, as from e to f in the section; but in the quatrefoil it is flat, only thrown back to the full depth of the recess below so as to get a sharp shadow instead of a soft one, the mouldings falling back to it in nearly a vertical curve behind [165/166] the roll c. This could not, however, be managed with the simpler mouldings of the smaller quatrefoil above, whose half section is given from g to g2; but the architect was evidently fretted by the heavy look of its circular foils as opposed to the light spring of the arches below: so he threw its cusps obliquely clear from the wall, as seen in fig. 2, attached to it where they meet the circle, but with their finials pushed out from their natural level (h, in the section) to that of the first order (g2), and supported by stone props behind, as seen in the profile, fig. 2, which I got from the correspondent panel on the buttress face (fig. 1 being on its side), and of which the lower cusps, being broken away, show the remnant of one of their props projecting from the wall. The oblique curve thus obtained in the profile is of singular grace. Take it all in all, I have never met with a more exquisite piece of varied, yet severe, proportion and general arrangement (though all the windows of the period are fine, and especially delightful in the subordinate proportioning of the smaller capitals to the smaller shafts). 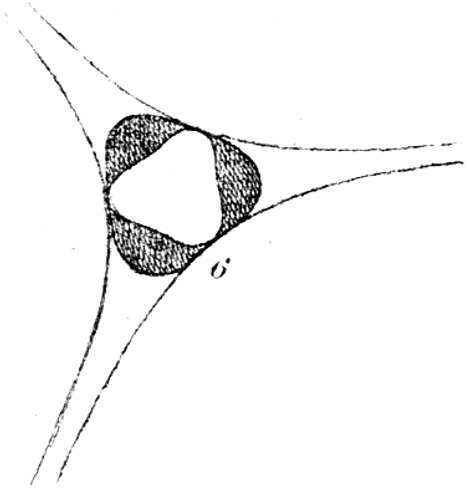 The only fault it has is the inevitable misarrangement of the central shafts; for the enlargement of the inner roll, though beautiful in the group of four divisions at the side, causes, in the triple central shaft, the very awkwardness of heavy lateral members which has just been in most instances condemned. In the windows of the choir, and in most of the period, this difficulty is avoided by making the fourth order a fillet which only follows the foliation, while the three outermost are nearly in arithmetical progression of size, and the central triple shaft has of course the largest roll in front. 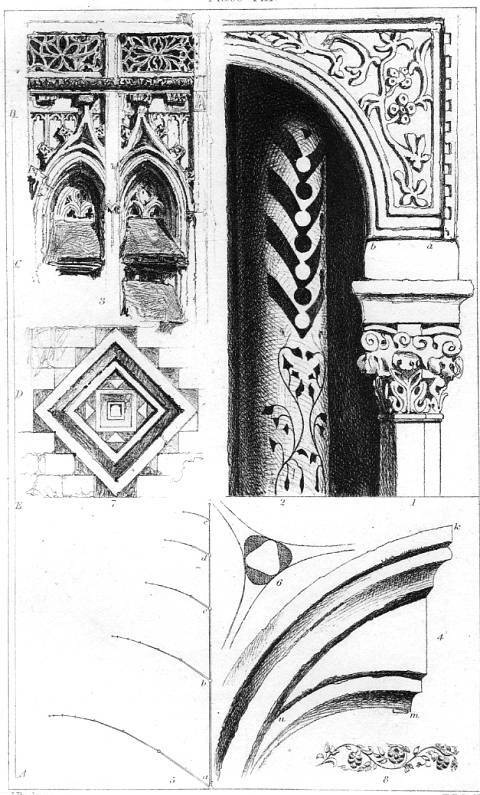 The moulding of the Palazzo Foscari57 (Plate VIII., and Plate IV., fig. 8) is, for so simple a group, the grandest in effect I have ever seen; it is composed of a large roll with two subordinates. on thumbnails for larger images.]. 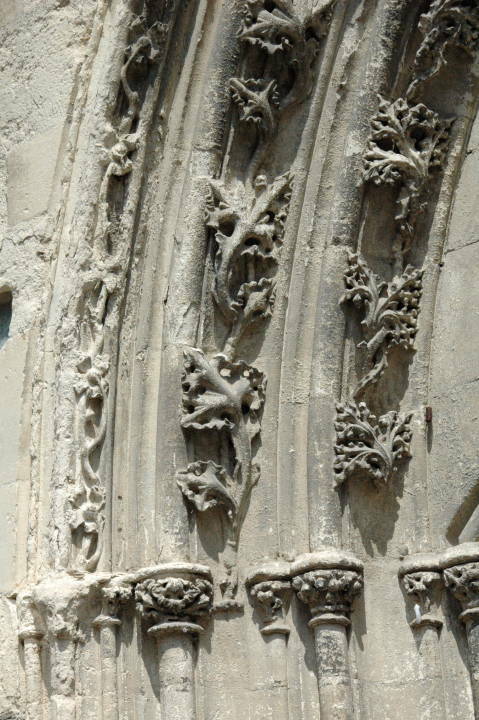 The leaf of this plant has five ribs on each side, as its flower generally five masts, arranged with the most exquisite grace of curve; but of lateral proportion I shall rather take illustrations from architecture: the reader will find several in the accounts of the Duomo of Pisa and St. Mark's at Venice, in Chap. V. 14-16. I give these arrangements merely as illustrations, not as precedents; all beautiful proportions are unique, they are not general formula. §30. The other condition of architectural treatment which we proposed to notice was the abstraction of imitated form. But there is a peculiar difficulty in touching within these [169/170] narrow limits on such a subject as this, because the abstraction of which we find examples in existing art, is partly involuntary; and it is a matter of much nicety to determine where it begins to be purposed. In the progress of national as well as of individual mind, the first attempts at imitation are always abstract and incomplete. Greater completion marks the progress of art, absolute completion usually its decline; whence absolute completion of imitative form is often supposed to be in itself wrong. But it is not wrong always, only dangerous. Let us endeavour briefly to ascertain wherein its danger consists, and wherein its dignity. § 31. I have said that all art is abstract in its beginnings; that is to say, it expresses only a small number of the qualities of the thing represented. Curved and complex lines are represented by straight and simple ones; interior markings of forms are few, and much is symbolical and conventional. There is a resemblance between the work of a great nation, in this phase, and the work of childhood and ignorance, which, in the mind of a careless observer, might attach something like ridicule to it. The form of a tree on the Ninevite sculptures is much like that which, some twenty years ago, was familiar upon samplers; and the types of the face and figure in early Italian art are susceptible of easy caricature. On the signs which separate the infancy of magnificent manhood from every other, I do not pause to insist (they consist entirely in the choice of the symbol and of the features abstracted); but I pass to the next stage of art, a condition of strength in which the abstraction which was begun in incapability is continued in free will. This is the case, however, in pure sculpture and painting, as well as in architecture; and we have nothing to do but with that greater severity of manner which fits either to be associated with the more realist art. I believe it properly consists only in a due expression of their subordination, an expression varying according to their place and office. The question is first to be clearly determined whether the architecture is a frame for the sculpture, or the sculpture an ornament of the architecture. If the latter, then [170/171] the first office of that sculpture is not to represent the things it imitates, but to gather out of them those arrangements of form which shall be pleasing to the eye in their intended places. So soon as agreeable lines and points of shade have been added to the mouldings which were meagre, or to the lights which were unrelieved, the architectural work of the imitation is accomplished; and how far it shall be wrought towards completeness or not, will depend upon its place, and upon other various circumstances. If, in its particular use or position, it is symmetrically arranged, there is, of course, an instant indication of architectural subjection. Aphorism 21. Symmetry is not abstraction. But symmetry is not abstraction. 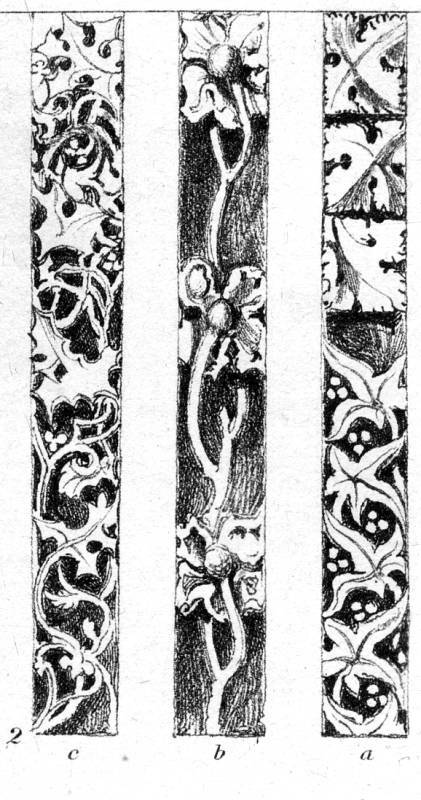 Leaves may be carved in the most regular order, and yet be meanly imitative or, on the other hand, they may be thrown wild symmetry is and loose, and yet be highly architectural in their separate treatment.63* Nothing can be less symmetrical than the group of leaves which joins the two columns in Plate XIII. ; yet, since nothing of the leaf character is given but what is necessary for the bare suggestion of its image and the attainment of the lines desired, their treatment is highly abstract. It shows that the workman only wanted so much of the leaf as he supposed good for his architecture, and would allow no more; and how much is to be supposed good, depends, as I have said, much more on place and circumstance than on general laws.64 I know that this is not usually thought, and that many good architects would insist on abstraction in all cases: the question is so wide and so difficult that I express my opinion upon it most diffidently; but my own feeling is, that a purely abstract manner, like that of our earliest English work, does not afford room for the perfection of beautiful form, and that its severity is wearisome after the eye has been long accustomed to it. I have not done justice [171/172] to the Salisbury dog-tooth moulding65 of which the effect is sketched in fig. 5, Plate X., but I have done more justice to it nevertheless than to the beautiful French one above it; and I do not think that any candid reader would deny that, piquant and spirited as is that from Salisbury, the Rouen moulding is, in every respect, nobler. It will be observed that its symmetry is more complicated, the leafage being divided into double groups of two lobes each, each lobe of different structure. With exquisite feeling, one of these double groups is alternately omitted on the other side of the moulding (not seen in the Plate, but occupying the cavetto of the section), thus giving a playful lightness to the whole; and if the reader will allow for a beauty in the flow of the curved outlines (especially on the angle), of which he cannot in the least judge from my rude drawing, he will not, I think, expect easily to find a nobler instance of decoration adapted to the severest mouldings. Now it will be observed, that there is in its treatment a high degree of abstraction, though not so conventional as that of Salisbury: that is to say, the leaves have little more than their flow and outline represented; they are hardly undercut, but their edges are connected by a gentle and most studied curve with the stone behind; they have no serrations, no veinings, no rib or stalk on the angle, only an incision gracefully made towards their extremities, indicative of the central rib and depression. The whole style of the abstraction shows that the architect could, if he had chosen, have earned the imitation much farther, but stayed at this point of his own free will; and what he has done is also so perfect in its kind, that I feel disposed to accept his authority without question, so far as I can gather it from his works, on the whole subject of abstraction. § 34. Under these limitations, then, I think that perfect sculpture may be72* made a part of the severest architecture; but this perfection was said in the outset73 to be dangerous. 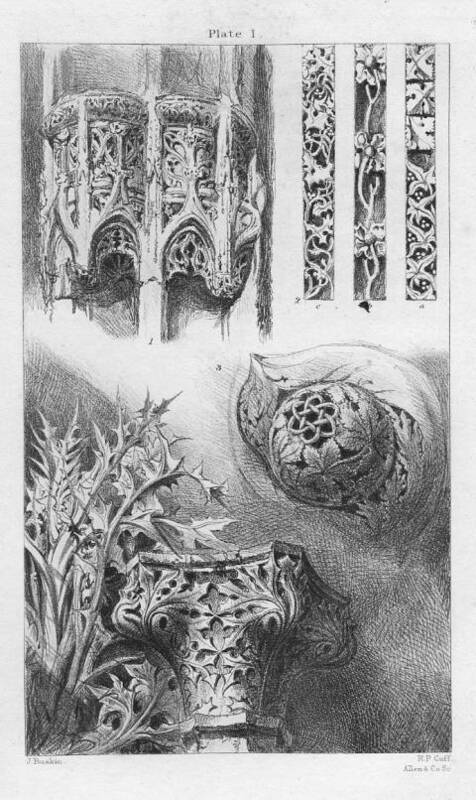 It is so in the highest degree; for the moment the architect allows himself to dwell on the imitated portions, there is a chance of his losing sight of the duty of his ornament, of its business as a part of the composition, and sacrificing its points of shade and effect to the delight of delicate carving. And then he is lost. His architecture has become a mere framework for the setting of delicate sculpture, which had better be all taken down and put into cabinets. It is well, therefore, that the young architect should be taught to think of imitative ornament as of the extreme of grace in language; not to be regarded at first, not to be obtained at the cost of purpose, meaning, force or conciseness, yet, indeed, [174/175] a perfection the least of all perfections, and yet the crowning one of all one which by itself, and regarded in itself, is an architectural coxcombry,74* but is yet the sign of the most highly-trained mind and power when it is associated with others. It is a safe manner, as I think, to design all things at first in severe abstraction, and to be prepared,75 if need were, to carry them out in that form; then to mark the parts where high finish would be admissible, to complete these always with stern reference to their general effect, and then connect them by a graduated scale of abstraction with the rest. And there is one safeguard against danger in this process on which I would finally insist. Never imitate anything but natural forms, and those the noblest, in the completed parts. The degradation of the cinque cento manner of decoration was not owing to its naturalism, to its faithfulness of imitation, but to its imitation of ugly, i.e. unnatural things. So long as it restrained itself to sculpture of animals and flowers, it remained noble. 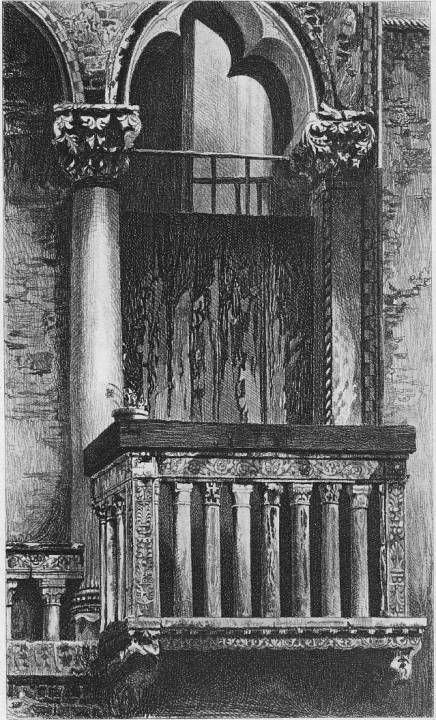 The balcony, on the opposite page (Plate XI. 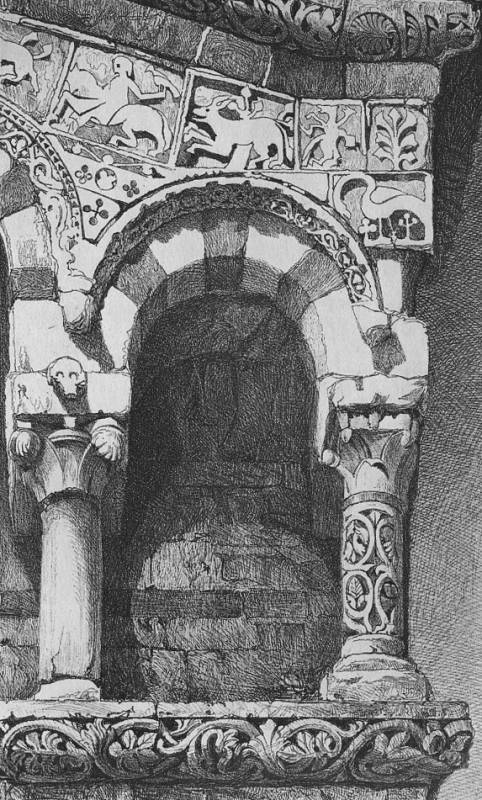 ), from a house in the Campo St. Benedetto at Venice, shows one of the earliest occurrences of the cinque cento arabesque, and a fragment of the pattern is given in Plate XII. fig. 8. 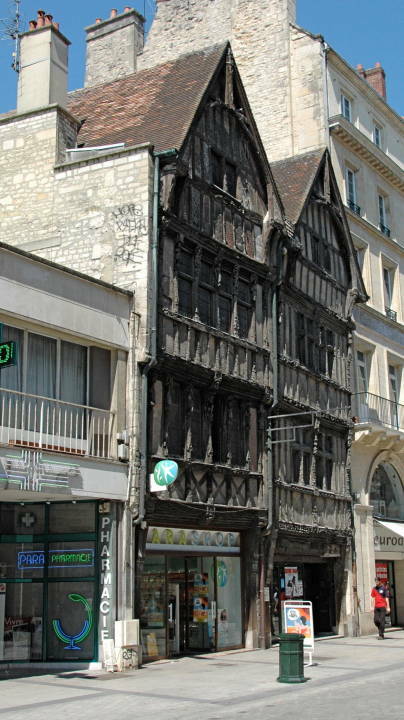 It is but the arresting upon the stone work of a stem or two of the living flowers, which are rarely wanting in the window above (and which, by the by, the French and Italian peasantry often trellis with exquisite taste about their casements). This arabesque, relieved as it is in darkness from the white stone by the stain of time, is surely both beautiful and pure; and as long as the renaissance ornament remained in such forms it may be beheld with unreserved admiration. But the moment that unnatural objects were associated with these,76 and armour, and musical instruments, and wild meaningless [175/176] scrolls and curled shields, and other such fancies, became principal in its subjects, its doom was sealed, and with it that of the architecture of the world. § 35. III. Our final inquiry was to be into the use of colour as associated with architectural ornament. I do not feel able to speak with any confidence respecting the touching of sculpture with colour.77 I would only note one point, that sculpture is the representation of an idea, while architecture is itself a real thing. The idea may, as I think, be left colourless, and coloured by the beholder's mind: but a reality ought to have reality in all its attributes: its colour should be as fixed as its form. I cannot, therefore, consider architecture as in anywise perfect without colour. Farther, as I have above noticed, I think the colours of architecture should be those of natural stones; partly because more durable, but also because more perfect and graceful. For to conquer the harshness and deadness of tones laid upon stone or on gesso, needs the management and discretion of a true painter; and on this co-operation we must not calculate in laying down rules for general practice. If Tintoret or Giorgione are at hand, and ask us for a wall to paint,78 we will alter our whole design for their sake, and become their servants; but we must, as architects, expect the aid of the common workman only; and the laying of colour by a mechanical hand, and its toning under a vulgar eye, are far more offensive than rudeness in cutting the stone. The latter is imperfection only; the former deadness or discordance. At the best, such colour is so inferior to the lovely and mellow hues of the natural stone, that it is wise to sacrifice some of the intricacy of design, if by so doing we may employ the nobler material. And if, as we looked to Nature for instruction respecting form, we look to her also to learn the management of colour, we shall, perhaps, find that this sacrifice of intricacy is for other causes expedient. § 36. First, then, I think that in making this reference we [176/177] are to consider our building as a kind of organised creature; in colouring which we must look to the single and separately organised creatures of Nature, not to her landscape combinations. Our building, if it is well composed, is one thing, and is to be coloured as Nature would colour one thing a shell, a flower, or an animal; not as she colours groups of things. I am quite sure that any person familiar with natural objects will never be surprised at any appearance of care or finish in them. That is the condition of the Universe. But there is cause both for surprise and inquiry whenever we see anything like carelessness or incompletion: that is not a common condition; it must be one appointed for some singular purpose. I believe that such surprise will be forcibly felt by any one who, after studying carefully the lines of some variegated organic form, will set himself to copy with similar diligence those of its colours. The boundaries of the forms he will assuredly, whatever the object, have found drawn with a delicacy and precision which no human hand can follow. Those of its colours he will find in many cases, though governed always by a certain rude symmetry, yet irregular, blotched, imperfect, liable to all kinds of accidents and awkwardnesses. Look at the tracery of the lines on a camp shell, and see how oddly and awkwardly its tents are pitched. It is not indeed always so: there is occasionally, as in the eye of the peacock's plume, an apparent precision, but still a precision far inferior to that of the drawing of the filaments which bear that lovely stain; and in the plurality of cases a degree of looseness and variation, and, still more singularly, of harshness and violence in arrangement, is admitted in colour which would be monstrous in form. Observe the difference in the precision of a fish's scales and of the spots on them. § 38. Now, why it should be that colour is best seen under these circumstances I will not here endeavour to determine; nor whether the lesson we are to learn from it be that it is God's will that all manner of delights should never be combined in one thing. But the fact is certain, that colour is [179/180] always by Him arranged in these simple or rude forms, and as certain that, therefore, it must be best seen in them, and that we shall never mend by refining its arrangements. Experience teaches us the same thing. Infinite nonsense has been written about the union of perfect colour with perfect form. They never will, never can be united. Colour, to be perfect, must have a soft outline or a simple one: (it cannot have a refined one;)83* and you will never produce a good painted window with good figure-drawing in it. You will lose perfection of colour as you give perfection of line. Try84 to put in order and form the colours of a piece of opal. § 39. I conclude, then, that all arrangements of colour, for its own sake, in graceful forms, are barbarous; and that, to paint a colour pattern with the lovely lines of a Greek leaf moulding, is an utterly savage procedure. I cannot find anything in natural colour like this: it is not in the bond.85 I find it in all natural form never in natural colour. If, then, our architectural colour is to be beautiful as its form was, by being imitative, we are limited to these conditions to simple masses of it, to zones, as in the rainbow and the zebra; cloudings and flamings, as in marble shells and plumage, or spots of various shapes and dimensions. All these conditions are susceptible of various degrees of sharpness and delicacy, and of complication in arrangement. The zone may become a delicate line, and arrange itself in chequers and zig-zags. The flaming may be more or less defined, as on a tulip leaf, and may at last be represented by a triangle of colour, and arrange itself in stars or other shapes; the spot may be also graduated into a stain, [180/181] or defined into a square or circle. The86 most exquisite harmonies may be composed of these simple elements: some soft and full of flushed and melting spaces of colour; others piquant and sparkling, or deep and rich, formed of close groups of the fiery fragments: perfect and lovely proportion may be exhibited in the relation of their quantities, infinite invention in their disposition: but, in all cases, their shape will be effective only as it determines their quantity, and regulates their operation on each other; points or edges of one being introduced between breadths of others, and so on. Triangular and barred forms are therefore convenient, or others the simplest possible; leaving the pleasure of the spectator to be taken in the colour, and in that only. Curved outlines, especially if refined, deaden the colour, and confuse the mind. Even in figure painting the greatest colourists have either melted their outline away, as often Correggio and Rubens; or purposely made their masses of ungainly shape, as Titian; or placed their brightest hues in costume, where they could get quaint patterns, as Veronese, and especially Angelico, with whom, however, the absolute virtue of colour is secondary to grace of line. Hence, he never uses the blended hues of Correggio, like those on the wing of the little Cupid, in the [181/182] "Venus and Mercury,"87 but always the severest type the peacock plume. Any of these men would have looked with infinite disgust upon the leafage and scroll-work which forms the ground of colour in our modern painted windows, and yet all whom I have named were much infected with the love of renaissance designs. We must also allow for the freedom of the painter's subject, and looseness of his associated lines; a pattern being severe in a picture, which is over luxurious upon a building. I believe, therefore, that it is impossible to be over quaint or angular in architectural colouring; and thus many dispositions which I have had occasion to reprobate in form, are, in colour, the best that can be invented. I have always, for instance, spoken with contempt of the Tudor style,88 for this reason, that, having surrendered all pretence to spaciousness and breadth, having divided its surfaces by an infinite number of lines, it yet sacrifices the only characters which can make lines beautiful; sacrifices all the variety and grace which long atoned for the caprice of the Flamboyant, and adopts, for its leading feature, an entanglement of cross bars and verticals, showing about as much invention or skill of design as the reticulation of the bricklayer's sieve. Yet this very reticulation would in colour be highly beautiful; and all the heraldry,89 and other features which, in form, are monstrous, may be delightful as themes of colour (so long as there are no fluttering or over-twisted lines in them); and this, observe, because, when coloured, they take the place of a mere pattern, and the resemblance to nature, which could not be found in their sculptured forms, is found in their piquant variegation of other surfaces. There is a beautiful and bright bit of wall painting behind the Duomo of Verona, composed of coats of arms, whose bearings are balls of gold set in bars of green (altered blue?) and white, with cardinals' hats in alternate squares. This is of course, however, fit only for domestic work. The front of the Doge's palace at Venice [182/183] is the purest and most chaste model that I can name (but one)90 of the fit application of colour to public buildings. 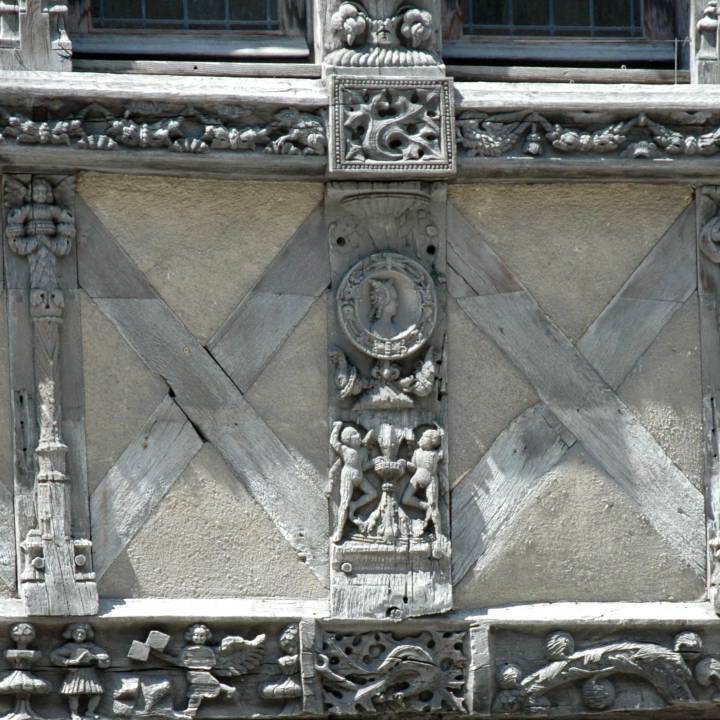 The sculpture and mouldings are all white; but the wall surface is chequered with marble blocks of pale rose, the chequers being in no wise harmonized, or fitted to the forms of the windows; but looking as if the surface had been completed first, and the windows cut out of it. In Plate XII. fig. 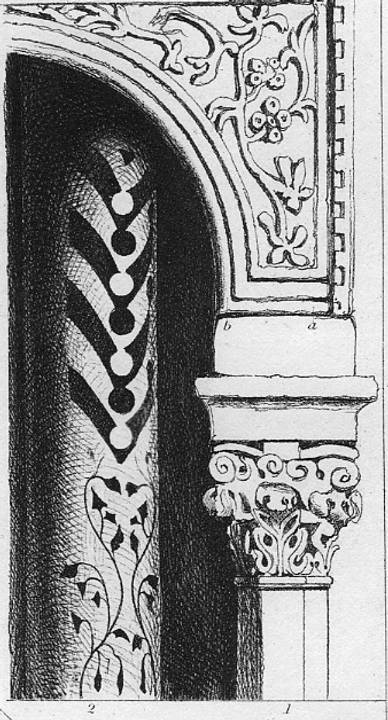 2, the reader will see two of the patterns used in green and white, on the columns of San Michele of Lucca;91 every column having a different design. Both are beautiful, but the upper one certainly the best. Yet in sculpture its lines would have been perfectly barbarous, and those even of the lower not enough refined. 1. Organic form dominant. True, independent sculpture, and alto-relievo: rich capitals, and mouldings; to be elaborate in completion of form, not abstract, and either to be left in pure white marble, or most cautiously touched with colour in points and borders only, in a system not concurrent with their forms. 3. Organic form abstracted to outline. Monochrom design, still farther reduced to simplicity of contour, and therefore admitting for the first time the colour to be concurrent with its outline; that is to say, as its name imports, the entire figure to be detached in one colour from a ground of another. 4. Organic forms entirely lost. Geometrical patterns or variable cloudings in the most vivid colour. On the opposite side of this scale, ascending from the colour pattern, I would place the various forms of painting which may be associated with architecture: primarily, and as most fit for such purpose, the mosaic, highly abstract in treatment, and introducing brilliant colour in masses; the Madonna of Torcello92 being, as I think, the noblest type of the manner, and the Baptistery of Parma93 the richest: next, the purely decorative fresco, like that of the Arena Chapel;94 finally, the fresco becoming principal, as in the Vatican and Sistine. 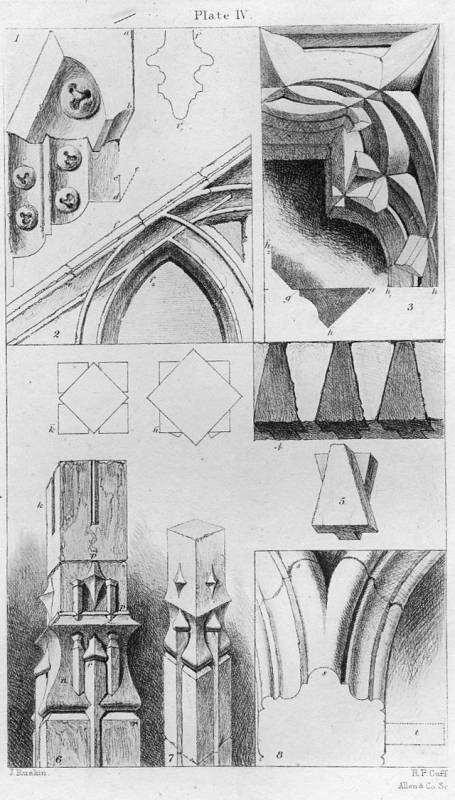 But I cannot, with any safety, follow the principles of abstraction in this pictorial ornament; since the noblest examples of it appear to me to owe their architectural applicability to their archaic manner; and I think that the abstraction and admirable simplicity which render them fit media of the most splendid colouring, cannot be recovered by a voluntary condescension. 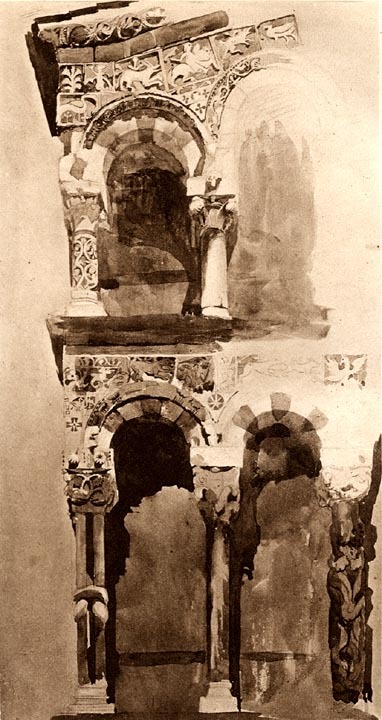 The Byzantines themselves would not, I think, if they could have drawn the figure better, have used it for a colour decoration; and that use, as peculiar to a condition of childhood, however noble and full of promise, cannot be included among those modes of adornment which are now legitimate or even possible. There is a difficulty in the management of the painted window for the same reason, which has not yet been met, and we must conquer that first, before we can venture to consider the wall as a painted [184/185] window on a large scale. Pictorial subject, without such abstraction, becomes necessarily principal, or, at all events, ceases to be the architect's concern; its plan must be left to the painter after the completion of the building, as in the works of Veronese and Giorgione on the palaces of Venice.